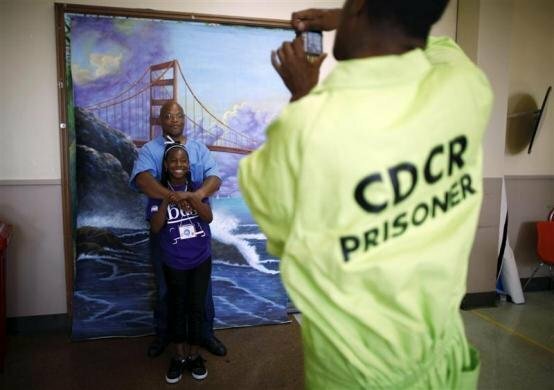 Many thanks to Shaul Cohen for the link to this photo montage of Father’s Day visits to San Quentin, California, US. 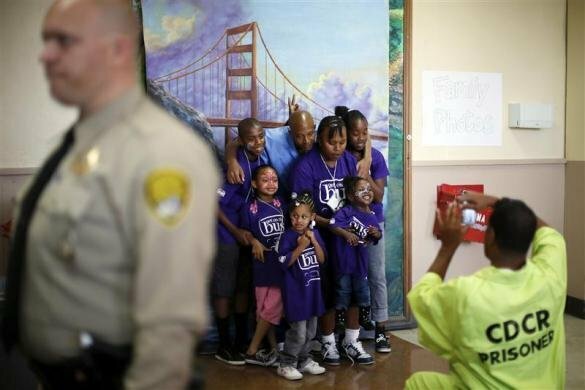 The website details the annual Father’s Day event, “Get On The Bus” which brings children in California to visit their fathers in prison. According to The Center for Restorative Justice Works, the non-profit organization that runs the “Get on the Bus” programme, 60% of parents in state prison report being held over 100 miles (161 km) from their children. Regular prison visits seem to lower rates of recidivism for the parent, and also have benefits for the children in maintaining a relationship with their parents. What struck me most about the montage, which includes images of children riding the bus, of parents and children reconnecting, and of fathers doing facepainting with their children, was these two images, of children wearing the purple t-shirts of the “Get on the Bus” programme, having their photos taken with their fathers, wearing prison-issue blue. In the visiting space there’s a backdrop of the Golden Gate bridge in San Francisco, and the smiling snapshots are taken in front of it. From the images it seems that the Golden Gate is not the only backdrop option, but its the one they’ve chosen for these images, or perhaps just the one that happened to be on offer on the day. I’m intrigued about the role of this backdrop for the fathers and their children, and why they chose to have their photos taken in front of it. Maybe the backdrop is just decorative – more decorative than the beige walls of the visiting space. Maybe it’s just conventional that a backdrop like this is used, like in a photographer’s portrait studio. Or maybe it’s there so that children showing these treasured images to their friends don’t need to explain where they were, or what was going on – although one might anticipate that the backdrop would raise more questions than it obscures. The backdrop image itself intrigues me too – by using a famous California landmark, there’s a reconnection to the locality, the state, and to the landscape that is familiar to the children and families on the outside. These images look almost like holiday snapshots – families on a day trip having their photo taken in front of the Golden Gate bridge. There’s an element of enactment here, heightened by the ‘stageset’ of the painted backdrop. It’s a small detail, but perhaps a significant one in terms of understanding what goes on during prison visiting, and the ‘performances’ that are undertaken by both visitors and visited, especially when families are far apart, visits are few and far between, and everyone wants the visit to go well. It also gives a tantalising insight into what happens after the visits are over, and the importance of visual records of the visits themselves, both for parents and children, in terms of the maintenance of a narrative of parenting and family, when a parent is incarcerated. The relationships between visiting and reduced recidivism, and visiting and children’s well being, have been observed in a range of contexts, but perhaps it is attention to details such as this, seemingly trivial issue of family photographs, that is key to understanding how these things are related to each other, and to enhancing these positive effects of visitation. Many thanks to Yvonne Jewkes for the recommendation of this website about the design of a planned women’s prison in Iceland, which brings together discourses about prison spaces and green building, and raises some interesting questions about the purpose of ‘green’ prison design. Instead of designing one large building (like a “typical repressive old prison”), they decided to break it into several “human-scale, connected” pavilions, which must be efficient and functional to enable the spatial separation of prisoners, but which must have “natural light and exterior views, to increase the feeling of freedom”. The architects also have an eye to the speed and ease of construction, and to the eco standards of the building, planning to draw upon Icelandic vernacular architecture to insulate the building. The prison facade will be constructed from peat-filled cages, planted with local flowers and grasses, both to provide cheap, prefabricated thermal insulation, and to deliver a facade “that changes with the seasons”, making prison life “less monotonous and more human and natural related”. 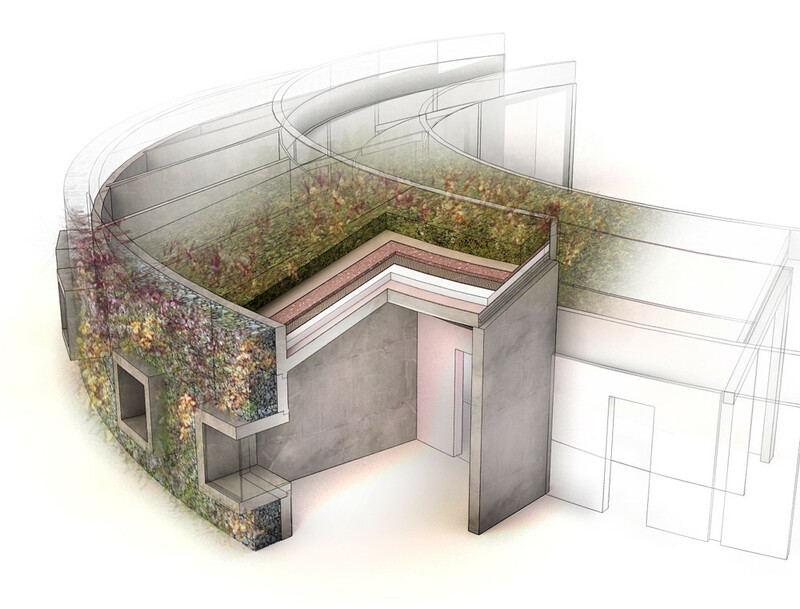 Whether prisoners housed within this planned prison will experience heightened wellbeing as a result of the prison design or the flowering walls is yet to be seen, but recent work within criminology has drawn attention to the importance of understanding the effect of prison design. A recent paper published in Punishment and Society directly considers the contribution that the physical environment makes to the pains of imprisonment, and Ioana-Christina Siserman (2012) considers environmental psychology as a means to understanding the effects that prison space has on transforming and shaping the behaviour of inmates. Thinking about the ‘natural’ elements of the Icelandic prison, as Laura Jackson (2003, 192) has argued “judging from the literature, the most healthful architecture exposes inhabitants to natural light and ventilation, views of greenery, and close proximity to outdoor green space”. A separate but related discourse within building design literatures focuses on prisons as ‘green buildings’, drawing attention to the use of distributed energy resources (DER) to reduce energy consumption. Such projects include rooftop photovoltaic systems, molten carbonate fuel cells, combined heat and power (CHP) units, all of which minimise energy bills and/or carbon emissions. 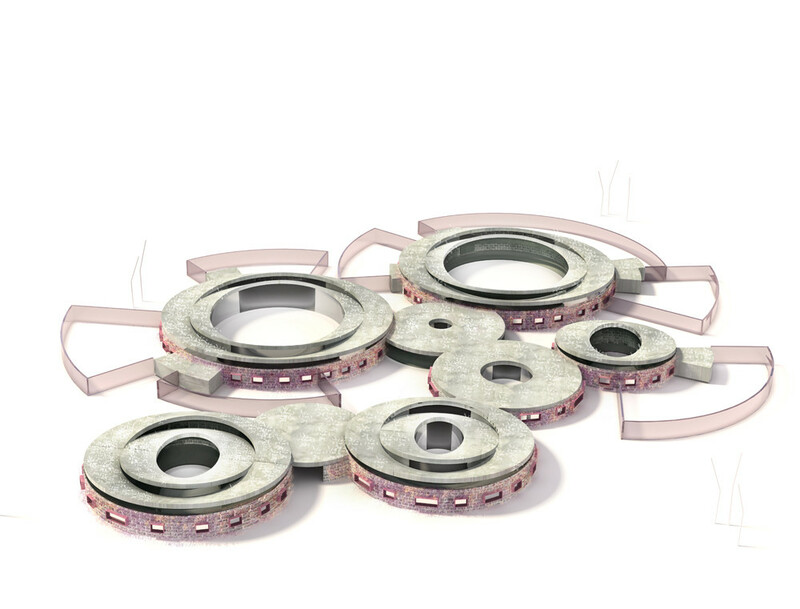 A recent report on Santa Rita Jail near San Francisco, CA, is an example of this kind of work. In the United States, according to Andrew Webster (2010), the building of ‘green prisons’ or the retrofitting of eco technology to existing buildings has dual benefits, first in lowering the cost of incarceration, and second in teaching prisoners valuable skills, which “could range from maintaining a solar farm to organic farming or other similar trade skills that would give them a better chance of avoiding recidivism, i.e. falling back into criminality, and therefore, a better chance of staying out of prison once they are released”. Essentially he argues that “environmentally friendly prisons will cost less to build and operate, decreasing the cost of housing inmates; and the use of inmates to maintain the facilities will decrease the incidence of violence within the facilities and recidivism”. ‘Green’ building means lots of things – from increasing natural light and exterior ‘natural’ views, to minimising energy consumption and making prison buildings thermally efficient and carbon neutral. There are some parallels between the US drive to reduce the operating cost of its immense carceral estate through energy efficiency, and the cheap thermal insulation provided by flowering peat in Iceland, but connecting prison design to prisoner behaviour is challenging, both at the level of prisoner wellbeing during incarceration, and in determining the effect of prison design (in terms of prisoners’ rehabilitation via green technology) on post-release outcomes.